Hey everyone! I’ve been busy making some changes to the website and adding some additional features. I hope you’ll find the new look as awesome as I do and enjoy the new features. As you can see, a lot has changed with the look and feel of the site from the last version. This new style is really designed to showcase the photos more by filling the screen real estate available. 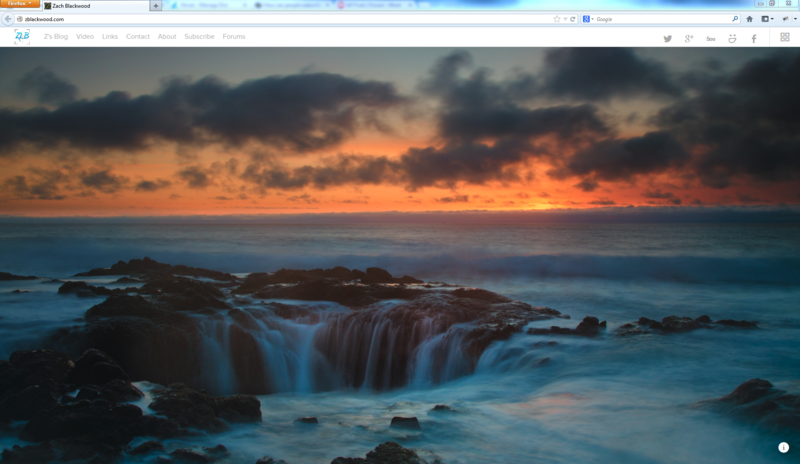 Combined with a thinner more streamlined navigation bar, the photos quickly become the focal point of the site. Wait, there’s yet another way to view the full images with additional information. See the little “i” button on the bottom right? Click on it! Go Ahead, it’s safe I promise. This will open up another great view with more information about the photo. Where it was taken, maybe a story involved with it, you never know what tidbits of information you may find here. Both the full bleed and information view can be navigated by using the arrow keys to move forward and backward between photos. One more way to view images faster! On the top right of the page, you’ll see 4 small square icons forming a larger square. This take you to a page to help teach geometry and basic math skills! What this button really does is displays the galleries in a grid layout filled with thumbnails of the images. This is a much faster way to browse through to a specific photo or view some of the other galleries such as my Portrait/People gallery! Clicking on an image will bring that image to full screen or clicking the top right again, where an X now appears will close the grid view. But wait! There’s more, you can now subscribe via RSS or mailing list. Apart from the different look and feel, I have also added 2 great new features. The first feature is an option to subscribe to mailing list! This mailing list will *only* be used to send you an email when I post new content on the blog. This way you don’t have to keep visiting the site (although I wouldn’t mind if you did) to check for new content. I also added a link to subscribe via RSS for those who prefer a news reader approach. To subscribe, simply visit the Subscribe page in the navigation bar at the top! This is more of an experiment and trial to get a great product and community going. I have implemented some forums where you can post all sorts of stuff. Favorite places to shoot, gear, questions, off-topic stuff, you name it! These forums are free and hosted by a service called Moot.It. You’ll be creating an account with Moot.it which will allow you to comment and use other forums created with this service as well. This is a new service, and it’s something I’m experimenting with to help create a better experience on my site. I have setup a few basic forums to get things started, and I can always add more if requested! I am still learning more about Moot, but it is pretty solid so far and a great, free way for anyone to setup some forums on their own site. Check them out! But Wait… No, that is about it for now! I’m excited about the changes and new features I’ve added. I would love to hear your thoughts on the new design and added features to the site both good and bad. Comment below or shoot me an email.. I’m always looking to improve and make things better and more enjoyable for visitors. Until next time, hope you enjoy the new stuff and subscribe to my mailing list for updates! Newport, OR public fishing pier with the famous Yaquina Bay Bridge. I’ve been photographing for a couple years now, and since that time I have been looking at everything with a completely new set of eyes. 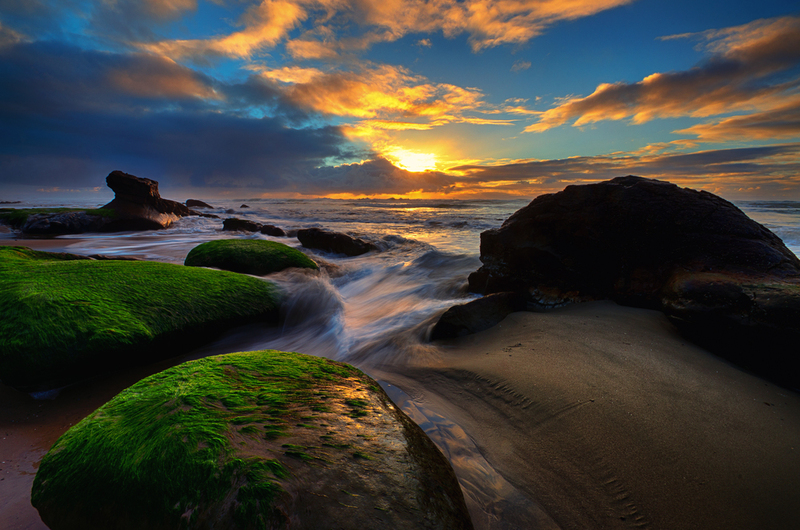 Naturally, people want to capture these grand, epic landscapes or portraits in exotic locations. I am certainly one of those people as well. It’s taken me quite some time now, but getting out and exploring closer to home is still just as interesting as exploring new places. It all depends on your mental eyes approach to your surroundings. All of the photo’s in this post are within a few minutes drive from my home. 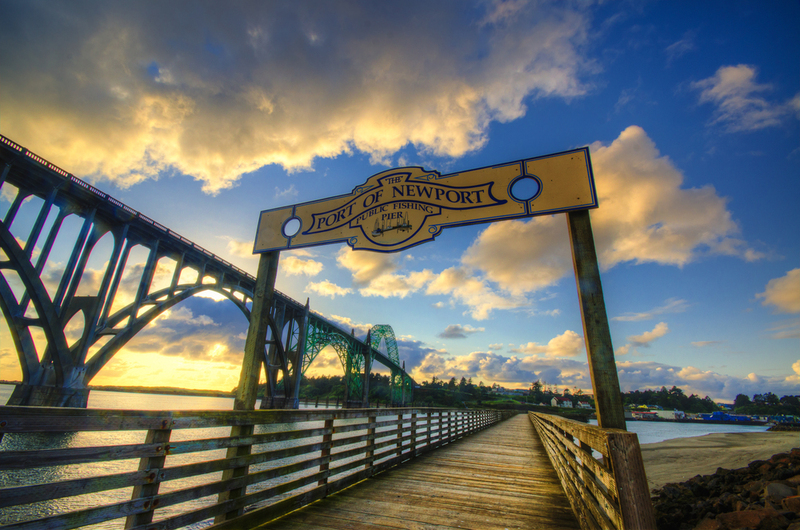 The photo at the top includes a very iconic bridge in Newport, the Yaquina Bay Bridge. Years ago there was talk and movements to building a new larger bridge to increase traffic flow. It ultimately got turned down, and is now constantly under repair to maintain it’s historic stature. There is no shortage of pictures containing this bridge in the world. I’ve got quite a few myself where the bridge is the sole focus of the image. Wanting to try something different, this sign for the public fishing pier is so obvious, that I never considered it. While walking around one day, I decided “what the heck, lets try it”. Got my tripod low, composed the shot with the bridge in the background, and it has turned out to be my favorite shot containing this bridge, and it’s not the sole subject in the photo as so often seen, like the photo below. Sure, the image may be beautiful to some, but what’s so interesting about it that you haven’t seen before? Nothing! 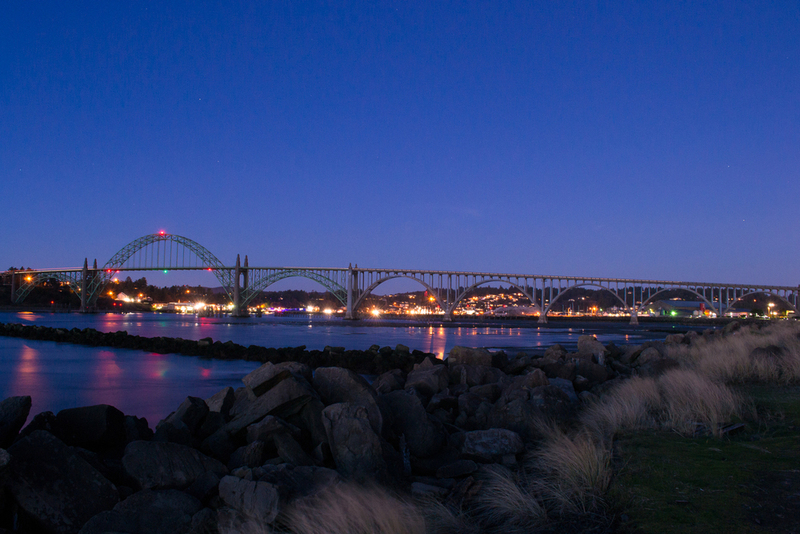 Yaquina Bay Bridge as seen during the blue hour from the south jetty. An old boat that’s been sitting along side the highway for as long as I can remember. This boat here has been along side the highway about 3 miles from home forever. I remember seeing it when I was a kid, and just simply thinking, “what an odd place to park a boat.” To this day, I still don’t know why it’s there or who it belongs to. I have driven by this boat thousands of times. Every time I drive into Newport and back home, I pass by it twice. 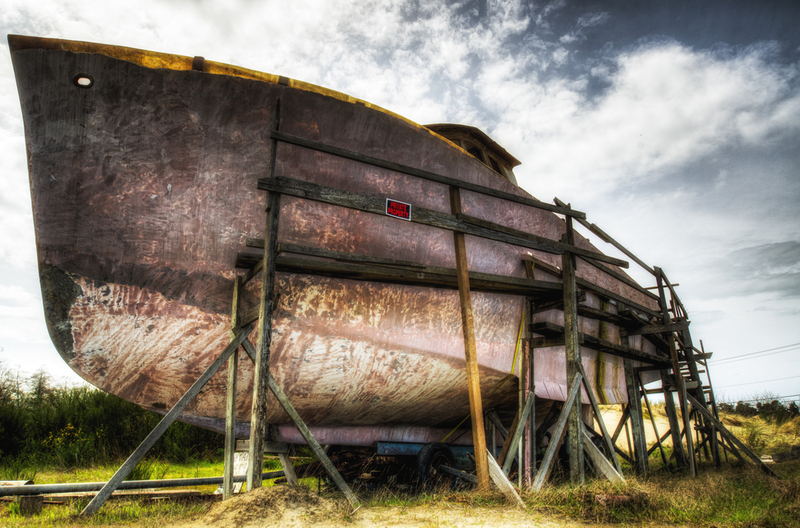 Took me quite some time to decide to stop and photograph this boat, even though it’s been there for such a long time. Who knows when this boat may fall apart, be moved, or even vandalized completely changing what has long been an after thought for me. Now, I have some great shots that if anything were to happen, I can always look back on. The very popular Ona Beach State Park, as seen during winter. If you follow me on social media, you will have recently seen this picture I got (above). This is at a popular state park, well known for it’s flat, boring ol’ beach. There is no shortage of just sand, and it certainly makes for a great family outing. However, that’s not very interesting to someone who lives just a few miles away. We see that all day every day. What’s interesting about this park is, that if you walk south instead of the usual north, you’ll run into this beautiful area. An interesting tidbit, these rocks are usually covered by sand during the summer, and only exposed during the winter. If we have had a stormy winter, there are even more rocks revealed. Put these rocks in your scene with the vibrant colors, include the famous sunsets as just a part, and you’ve got a whole new look than what is usually found. 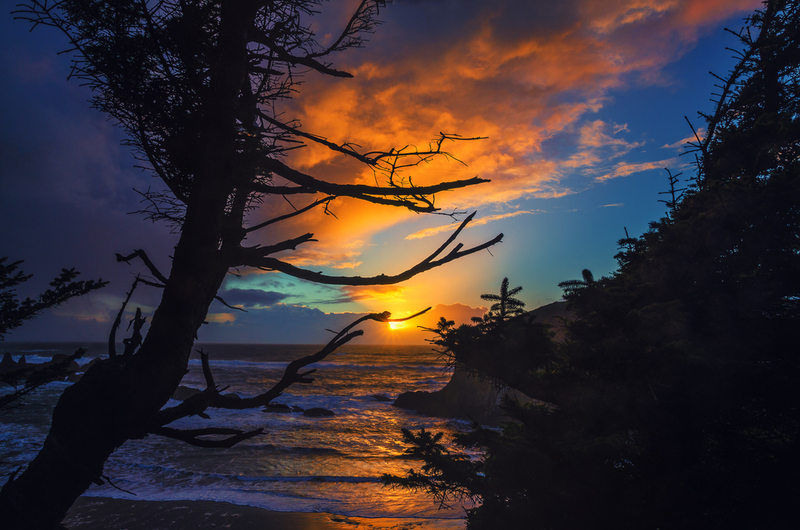 Lastly, the photograph below is from another very popular spot, Seal Rock. This tiny little town has some gorgeous rocky landscapes that provide for consistently great photographs. I drive by this place twice a day for work, and shoot here a lot. It’s easy to capture a beautiful landscape, but it’s a little more difficult to capture something new in such a highly photographed area. I went exploring and walking around in different areas that I don’t normally walk through trying to find a different vantage point. That is when I found this small little overlook that provided a great view of the setting sun, the ocean below, a little bit of the famous Seal Rock itself, while providing some new elements that are much more prominent in the frame. A new vantage point for me to consider shooting out a few more times while still trying to find others. This post isn’t to simply tell you about what I’ve found or show off my images. The goal is to help inspire you get out and explore closer to home and see what new interesting places and things you find. Whether you shoot landscapes, architecture or even people, I guarantee you’ll be able to find A LOT of new and inspiring subjects to shoot. Check out some of your favorite places as a kid during different seasons, you may find a completely different scene different times of the year. I certainly found one I wasn’t aware of. Go explore with different weather conditions. Everyone loves a beautiful sunset, but what’s so interesting when you see a million of those every day? Go shoot the same place when it’s snowing, raining, cloudy, you never know what amazing stuff you will run across. When it comes to objects, capture them, before they are gone. You just don’t know how long things will be around, and that can include major structures like a bridge. Who knows, maybe you’ll capture a historic moment that will live on well beyond your own years, all because you decided to take a closer look at exploring close to home. that you may not have noticed or appreciated before. What inspires you to go out and explore close to home?